Could your dog benefit from guard dog training? Home - Resource Centre - Could your dog benefit from guard dog training? Training your dog as a guard dog could be beneficial to your family, your home, and your dog. Dogs have a natural instinct to protect their territory (your home), and their family. Extra training beyond the usual basic commands uses their natural instinct to protect as the basis for training. It has been noted that dogs suffering from low confidence, after training have become more confident. Guard dog training may also increase their physical fitness, help them overcome noise related fears, increase their sense of loyalty and increase their response time and reflexes. A guard dog will generally have a higher sense of respect for their master, though they will still continue to be the much loved and cherished family pet you already knew and loved. You will embrace quality bonding time with your pet while he or she heightens their natural protection instincts and promptly responds to basic every day commands. Your dog taking you for walks will also be a thing of the past, as they will learn how to walk correctly on a lead. It’s almost needless to say that the rewards coming from pet ownership speak for themselves. However, with a trained guard dog you, as the owner, may experience a heightened sense of safety in your home or when having to leave your home, especially during “high break-in” points of the year. The whole family will benefit from the respect of common commands such as “sit” and “stay”. A dog with guard training will only listen to his owner and family, so there’s a heightened sense of loyalty and bond toward your family and members, which most will agree is a huge reward on its own. Naturally aggressive dogs pose a very real threat to society; there is an undeniably large amount of dog attacks each year, usually unprovoked and often involving children. 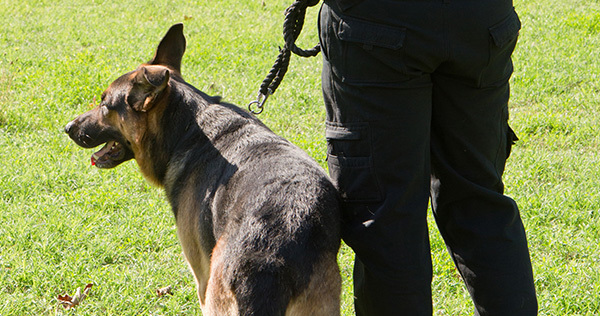 A professionally trained dog, despite having a heightened need to protect, will also be able to determine if a person is a threat or not, reducing the number of unprovoked attacks toward the general public. If you think your home and family could benefit from the added security of a guard dog, or your dog could benefit from the extra training contact Dog Security to discuss your options.